Grits. Worshiped in the South, misunderstood in the North, and treated with puzzled amusement everywhere else, grits are a basic breakfast food, a wonderfully complex base for upscale cuisine and about everything in between. For Lent grits can have a particular place. If you don’t much care for the ubiquitous mac and cheese, grits can take boring fish or shrimp and elevate the Friday tradition to almost…well…heavenly levels. And, like pasta and rice, if we learn a couple of basic proportions and think outside of the traditional methods of eating grits, they are one of the most friendly staples for the small kitchen. 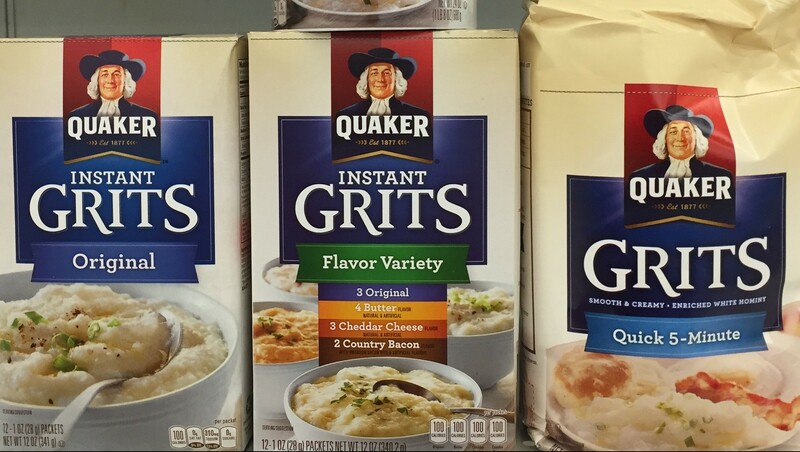 The problem with grits is what happened when they went commercial. They started simple. 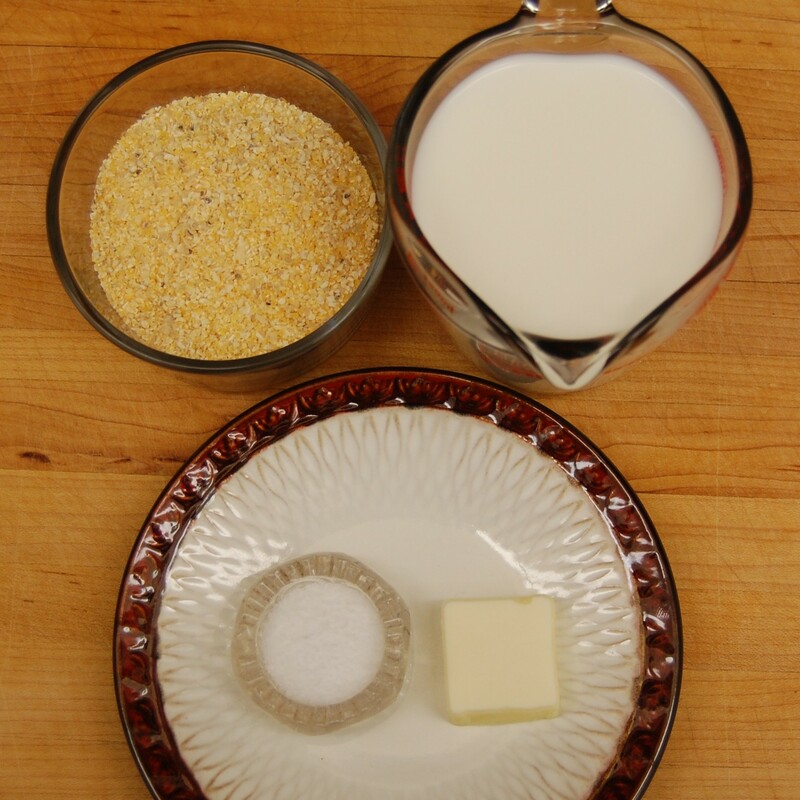 Native American in origin grits were a porridge that, like rice or pasta, would then have a few toppings added. They stored well, even in high humidity, were made from an abundant and easy to grow grain (corn or maze), and had enough substance to carry a hungry hunter from breakfast to coming home after a hard day stalking dinner. Finally, they were easy to carry around. One half a cup of dried grits slow cooked up would easily serve four. Not even rice had that kind of density. 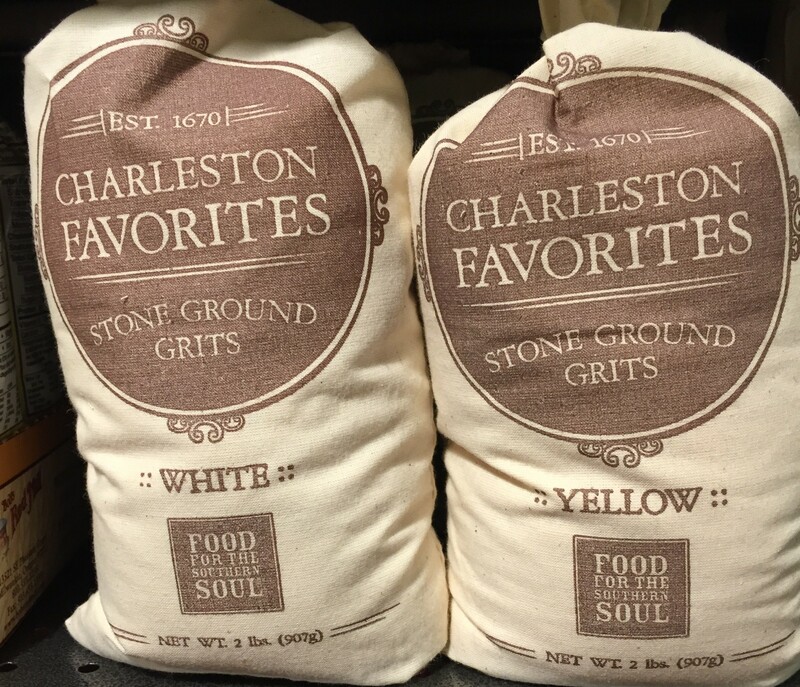 less…”gritty”…grits were in serious trouble. Almost all of the subsequent ridicule and malignant of this basic dish stems from one simple rule: the quality of the grits is directly proportional to the cook time. The longer it takes to cook grits the the tastier the outcome. The problem, at least here up north, is finding good grits. 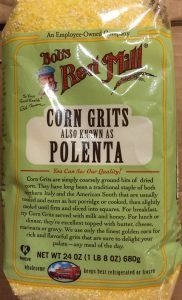 Most specialty markets will carry at least one type of stone ground grits that are long cooking and are not commercially produced (or ruined as grits enthusiasts would say). Nationally even mega marts carry Bob’s Red Mill products which are pretty respectable grits. 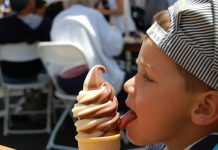 Although most of the time we should always try to shop locally it isn’t a bad idea, if you decide you like using grits, to investigate internet options. And don’t hesitate to use your resources. 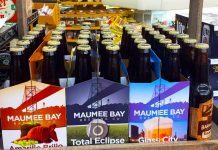 If you know someone in the South get them to send you a local mill variety. The shipping might end up being more expensive than the product but well worth it. Grits store fine in the pantry. However, if you are really concerned about fancy grits put them in a zip lock bag and store in the freezer between uses. Mix the grits, liquid and salt together in a heavy pan. 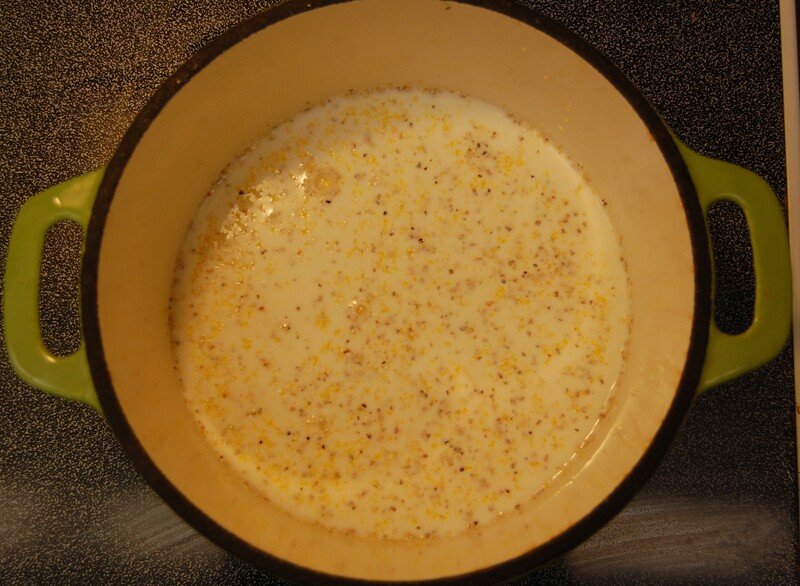 Grits and Milk starting out on the stove. This makes enough grits for 2-3 modest servings or two big servings. Even for a single person it is a good idea to double the recipe. 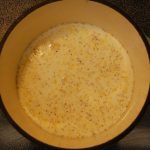 The grits keep in the fridge just fine for a few days and they warm up in the microwave quickly and easily. Just add a bit more milk as you reheat. Above all, after an evening meal you can reheat for a couple of quick breakfasts. 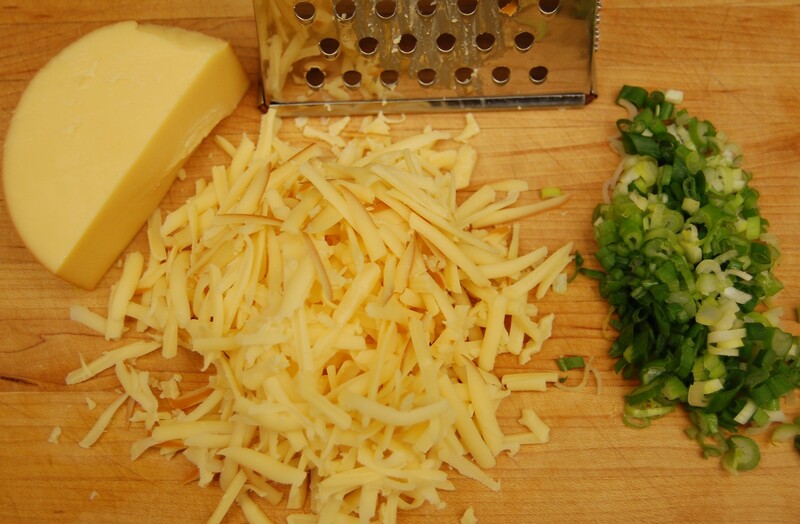 Chopped green onion and grated smoked gouda ready to add to grits. Sautéed onions: Take the butter and sauté onions in the butter prior to adding to the grits. You can also sauce peppers and garlic with the onions. Meat: Crumbled sausage (cooked), crumbled bacon (cooked), diced ham, and/or chorizo/andouille are excellent additions. 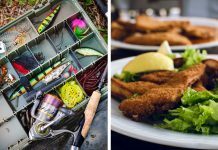 Herbs: Fresh herbs are a great addition especially if you are serving with fish. 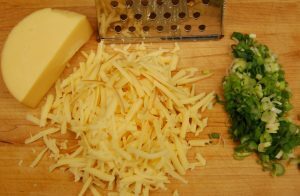 Something as simple as finely chopped parsley (fresh only) or finely chopped green onion completely changes the character of basic grits. 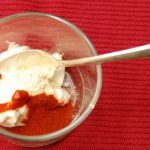 Smoked Paprika, Hot sauce, salsa: Any of these three things will change the character of the grits. 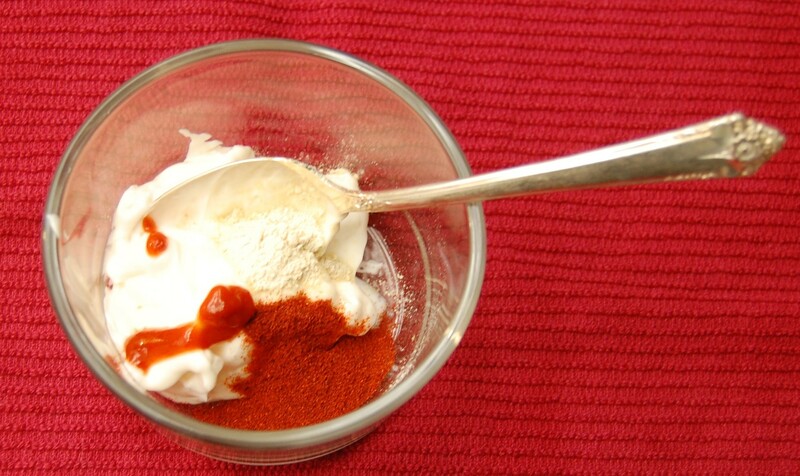 A couple of tablespoons of salsa, a teaspoon of smoked paprika (hot or mild), and almost any hot sauce will take grits over the top. Chili: Yes it sounds crazy to northern ears but we have chili mac and the south has grits and chili. Many places will serve a wide bowl of chili with a scoop of grits in the center. Check out our small batch chili recipe for a great pairing. Make sure you pat the fish dry. 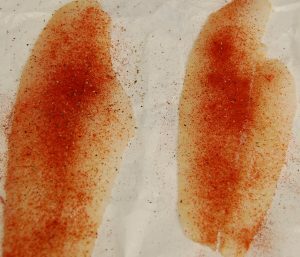 Dust both pieces of fish with the salt, pepper and paprika. If you don’t have smoked paprika get some. 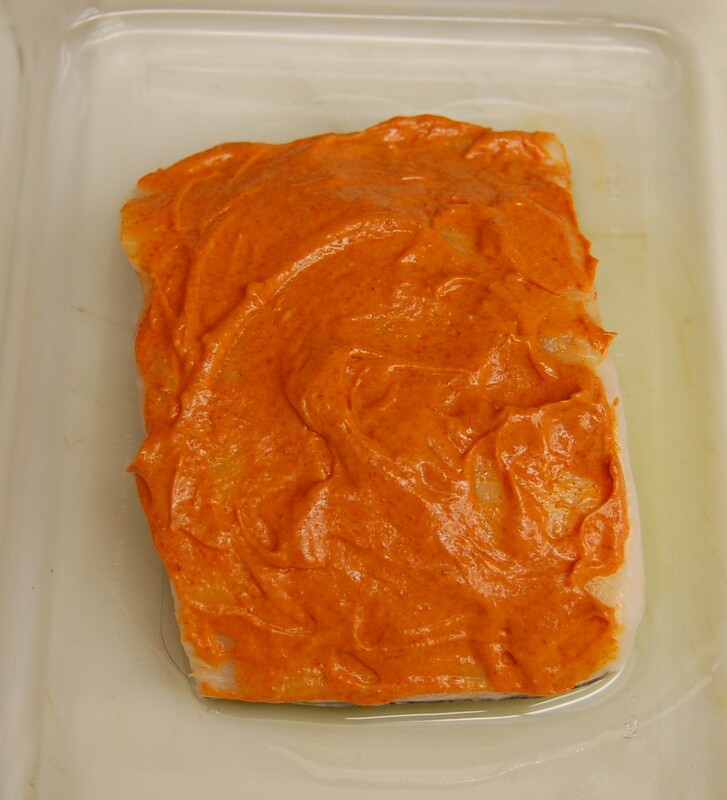 Regular paprika will do in a pinch. In a large skillet sauté both pieces of fish in olive oil turning only once. 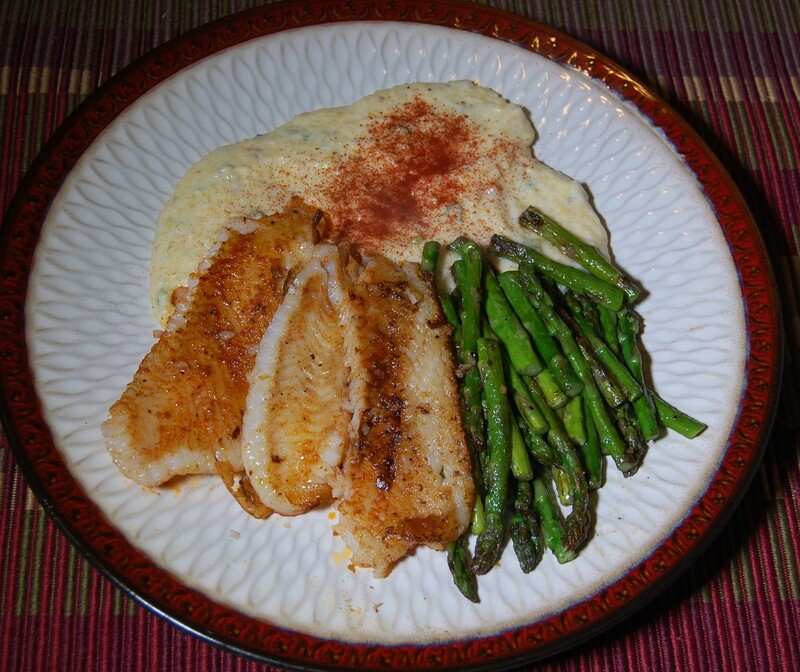 Place a scoop of the smoked grits on a plate and place a serving of the fish over each serving of grits. 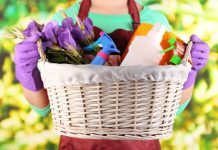 Recommended vegetables include anything green, including Brussel sprouts, sautéed spinach, baby peas, or green beans. (Prepare grits per package. Cook slowly and stir often. Add butter when done. Just before serving with fish add in the cheese and green onion and stir until the cheese is melted). the mixture (not too thick) and place in a baking dish. Bake for 10 minutes at 400F then check. Fish should be light and flakey. Depending on the thickness of your cod it can take up to an additional 10 minutes to finish. If you have an aversion to mayo just coat the top of the fish with a little olive oil and coat with the rest of the seasonings. You will want to add some salt if not using mayo. 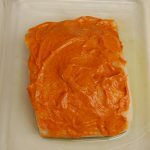 The oil/mayo helps keep the fish moist during the baking process. 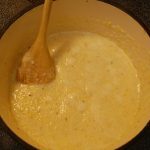 When you make grits, whether for one or two, the recipe listed will serve you through about two meals if you are a modest eater. You are wide open for the second meal but the obvious choice is to reheat your grits (and be prepared to add a bit more liquid) and then serve for breakfast with a couple of eggs cooked the way you like them. If you haven’t had two eggs on top of grits and cheese it is to die for. Plus, since the grits are already cooked, the whole breakfast takes only as long a it takes to cook a couple of eggs. Finally, don’t stop with the traditional shrimp and/or fish and grits. Almost any meat will do as long as it is seasoned up. 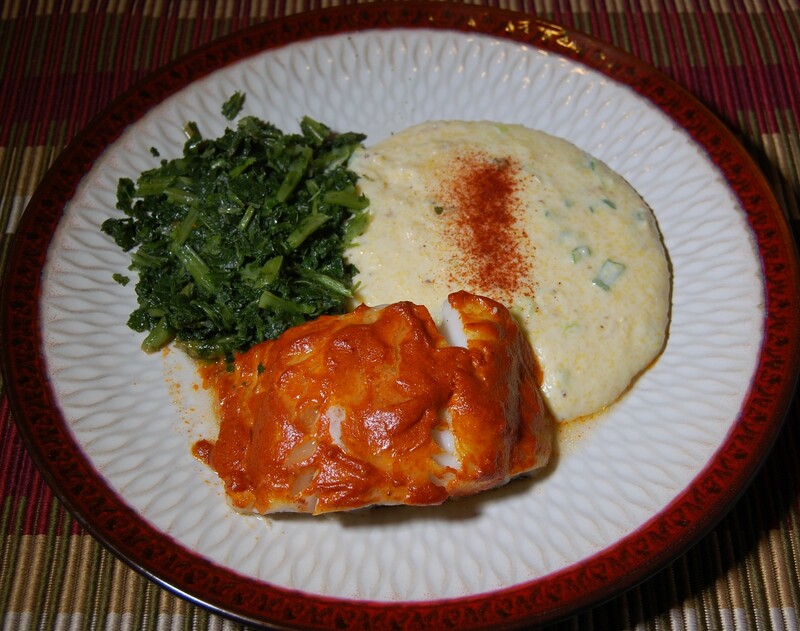 A good marinated chicken breast or sautéed point going is a great combination with hearty grits. Check out our idea for quick portend and per with grits. Finally, almost all of us have parmesan cheese in our refrigerator. As long as you lower the salt from the original recipe and add liquid as needed, Italian sausage and parmesan grits would be a meal to make any native of Italy proud. 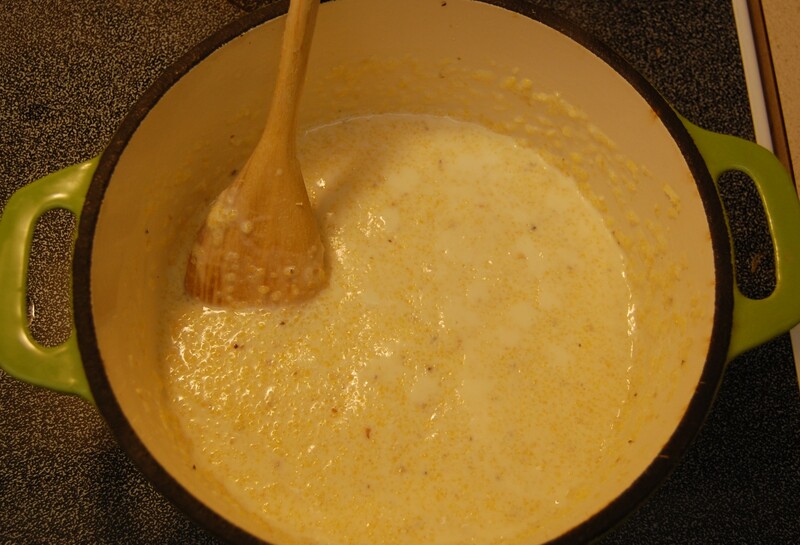 Another option- take those leftover cheese grits and pour/spread them out into a small plastic container. The next day pop them out (they congeal when they cool), dust them with flour, and then FRY them. Then top them with something good. After all- they’re southern. 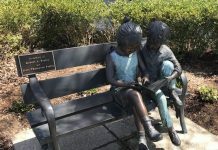 Shoppers on Site: Summer Reads!